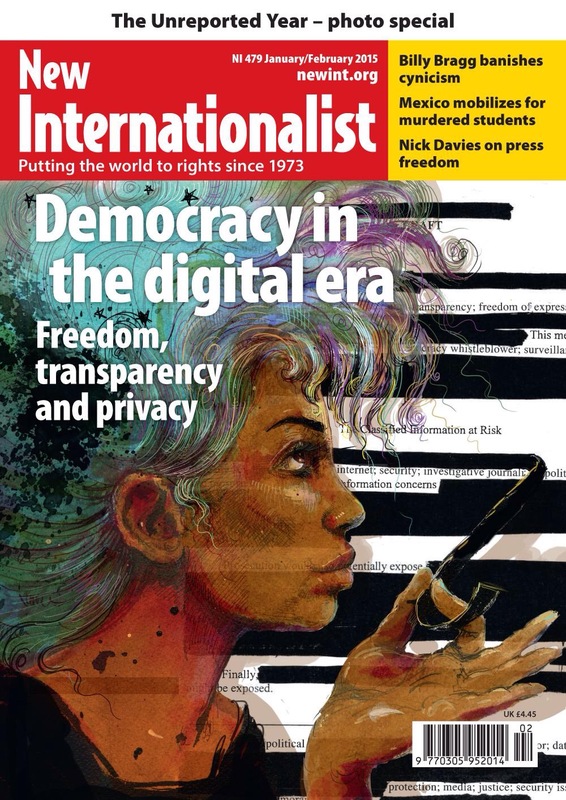 Molly Crabapple illustrated the cover for this month’s New Internationalist. Inside this issue: Icelandic activist and founder of the Pirate Party, Birgitta Jonsdottir, guest edits an issue on the theme of ‘democracy in the digital era’. It tackles some of the thorniest issues of the day: privacy, censorship, mass surveillance, media freedom. But it goes several steps further than most media reports by presenting powerful and practical ways in which we can create a deeper and more meaningful democracy and a richer more rebellious political engagement, using the tools of the internet age. This entry was posted in Uncategorized on January 15, 2015 by Molly. Molly Crabapple is an artist and writer in New York. She is the author of two books, Drawing Blood and Brothers of the Gun, (with Marwan Hisham). Her reportage has been published in the New York Times, New York Review of Books, The Paris Review, Vanity Fair, The Guardian, Rolling Stone, and elsewhere. She has been the recipient of a Yale Poynter Fellowship, a Front Page Award, was shortlisted for a Frontline Print Journalism Award and longslisted for a National Book Award. She is often asked to discuss her work chronicling the conflicts of the 21st Century, and has appeared on All In with Chris Hayes, Amanpour, NPR, BBC News, and more. Her art is in the permanent collections of the Museum of Modern Art, the United States Library of Congress and the New York Historical Society. She is currently the Spring 2019 artist in residence at NYU's Hagop Kevorkian Center for Near Eastern Studies.